I want to design and develop games and let’s be honest, who wouldn’t want to do that. In truth I want to design video games; I can’t think of a single person I shared a lecture theatre for 3 years with who wouldn’t want to be involved with game design in one form or another. I’ve tried my hand at game programming before (as you will see in the future), but that has always been homebrew; nothing official, and always centred around algorithms or simulations. Video games are great, but the number of different skills required makes it difficult for a one-man-band, and unless you can drag someone else along with the same dream and different skill set I am afraid you are on your own. Making a game is relatively easy, but thinking of a game is the problem I have. So I shelved that dream. Until I stumbled upon Kickstarter, that is. For those that don’t know; Kickstarter is probably the biggest crowd sourcing website out there. The idea is that you post your project, and people fund it in return for some arbitrary deliverable. One example would be developing a new card game, and those deciding on funding $500 (it’s a US site) would receive an uncut sheet of the original design signed by all those involved – down to $1 receiving a thank you on the website. At which point my brain perked up and said “I can do that” and set out developing the next big thing. I will tell you that it was HARD. My career path involves me bringing ideas to life, but there is always a brief to work to, and at worst my industry market to aim at. I literally had nothing to work from other that “I can do that”. I immersed myself in the culture, from reading www.dicecreator.com and www.stormthecastle.com, to signing up to various game designer forums. I wish I was joking, but all I could see was an excuse to build a laser engraver for custom dice, and crafting my own inch high figurines for game tokens. Thankfully, I took a step back. This wasn’t just running before walking; I was a toddler doing a triathlon. I knew my weakness was having the idea, and I was willing to spend hours learning how to model figurines for a game that didn’t exist. This was something that my GCSE in Fine Art did not prepare me for. I knew I needed help, so I did what any self-respecting engineer would do – I downloaded an eBook. 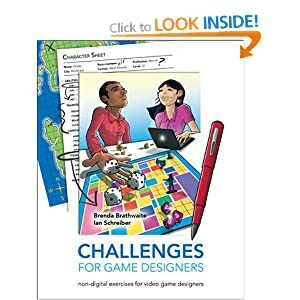 Challenges for Game Desig ners by Brenda Brathwaite and Ian Schreiber became my Bible. This was 317 pages of pure gold, and I felt like I was at university again. I would fall asleep with it in hand, wake up the next morning and continue where I left off. This book set out weekly assignments and group exercises (not that I had a group). It broke game design down into manageable blocks, and it teaches you how a game works; not how to make a game. That is just what I wanted. I know what a sprite is, and I know how to move it around a screen. I know the importance of non-blocking calls, and how to have a responsive UI. After moving to Northampton, my selection of available focus groups dropped to 1; my children. There is a point in a child’s life when Mousetrap, and Snakes and Ladders becomes boring. A realisation dawns that there is nothing that child can do to influence a game; the likelihood of defeating a rival sibling is equal to being beaten. This is the eternal battle between skill and luck. You will realise this too when your adorable child morphs into demon spawn purely because they “never win”. I didn’t want to be the one who designs a game responsible for that metamorphosis. But at the same time, my children aren’t ready for the strategic requirements of Risk – which probably explains why I keep winning. And so The Planting Game was born. The idea is to cover an 8×8 grid with counters of your colour. Prepare your die by taping -1 and -2 over 5 and 6 respectively. Each player has a side of the board, and must place counters either in a square directly adjoining that player’s side, or a square in that player’s possession. When the dice is thrown and a positive number is rolled the player places that many counters on the board. If a negative number is rolled, the player removes that number from an opponent. If any counters are orphaned, that is are unable to trace a route back to the player’s side, then that counter is removed from play. The person with the most counters at the end wins. The game is still rough around the edges, but the children love it. Using dice means that luck is never far away, but tile placement along with tile removal introduces that level of skill. Do you always plant three across to reduce the chance of losing additional tiles as orphans, or do you race towards the opponent to stunt their growth? In interesting choice for a 5 year old to make. This entry was posted in Board Games and tagged boardgame, foolish on November 11, 2011 by admin.